The General Motors’ decision to wind up the production of the brand, Saturn, dealt a major blow to many of the dealers countrywide. According to the GM’s reports, the U.S. sales for Saturn from January to October this year marked a collapse of 62 percent from the same period of 2008, which is down to 63,839 vehicles. The sales in October fell to 57.8 percent or 3,623 vehicles. Today the company has around 9,400 Saturn cars as inventory as reported by the GM’s vice president of U.S. sales, Susan Docherty during a sales conference call. She said that the company does not expect any obstacle in the sales of the outstanding units. However, the dealers are more worried on selling the remaining units after the Saturn sales came to a screeching halt last month when Penske Automotive Group withdrew from the deal to take over Saturn. A Saturn dealer at the Motor City Auto Center in Bakersfield, Calif., who had sold 21 new Saturns in September, however, managed to sell only seven units the last month. The General Manager John Pitre who has 51 Saturns in stock thinks this fall will take a minimum of five months for him to sell off the remaining units. The decision to wind up the production of the General Motors brand, Saturn, has brought in a period of anxiety to the minds of the people in the small town of Spring Hill, Tennessee. The withdrawal of the retailer, Penske Automotive Group, from buying the brand Saturn renders many jobless. Jill Lajdziak is one of those people who witnessed the whole lifetime of Saturn, from its pre-launch era to its death. Lasjdziak, who joined Saturn before the launch of the first car in 1990, continued with her contribution until its demise last month. Lajdziak will take a vacation until her retirement from the General Motors Company at the end of this year, said the spokesman John McDonald. The job of bringing a great era to a close is left to the GM’s general manager of the retail sales support, Steve Hill. The last few weeks saw a group of hopeful people keeping a close watch over the deal between the Penske Automotive Group and the GM. The withdrawal of Penske came as a shock to many as it was followed by GM’s announcement to stop the production of Saturn. The show comes to an end when the “dealers are able to sell their inventory and wind their dealerships down,” McDonald said. Lasjdziak, who is a graduate from the University of Wisconsin with a bachelor of arts in business marketing and management, began her career with GM in the year 1980 as the district sales manager with Chevrolet. She became the manager of the retailer division of Saturn in 1986. Her passion for cars grew from growing up with her father who was a Chevrolet and Oldsmobile dealer in a small Wisconsin town. She started her small “career” by assisting her father in washing new cars at the age of three. When she was interviewed by Procter & Gamble at the early years of her career, who asked where she sees herself after a period of five years, she commented, “I want to be working for GM.” The interviewers reply to check out this option brought a major break in her career. Twenty three years of Lasjdziak’s career was spent in the different managerial level jobs with Saturn. In 1999, her contribution got rewarded when she was made the general manager of this brand. Today, the demise of Saturn brings a glorious end to the career of people like Lasjdziak. The decision to close down the GM brand, Saturn, by the company after the attempt to sell it to Penske Automotive Group fell through, came as a major disappointment to the people in the small town of Spring Hill, Tennessee. The first car of the brand Saturn, a red S-Series that was launched in 1990 is still kept for display in the factory premises. The factory and the town have hosted many tours and reunions for the Saturn car owners as a part of their promotion programs. The City Hall has the walls decorated with the photographs of the old town of Spring Hill before and after the arrival of the brand, Saturn, depicting an era of development. The residents and the Mayor credit GM’s Saturn for the major developments the town has witnessed over the period. But later, the locals saw GM rolling off Saturn from Tennessee in 2007 to replace it with the building of Chevrolet Traverse that is now on its way out. The company has made plans to transfer the production of Traverse to a plant in Michigan, closing down the Spring Hill factory. This decision of the General Motors to wind up the factory has left the residents in a state of perplexity. A few, who had remained hopeful of Penske’s ability to revive the brand, were unable to understand its decision to pull away from the deal. Others are still in a shock over the fall of the auto giant GM that can leave many locals jobless. One of the local residents put the blame on the federal government calling it responsible for the fall of the automotive industry in the country. The locals are also wishing for a revival of the economy that can put back the things to its normal state. To quote a resident, Dinwiddie, who is confident of the future of Spring Hill, “I have to believe the plant is going to come back. It all depends on the overall economy. I hope that Americans start buying American products and start supporting the American auto manufacturing industry and if that happens, we’ll get a product in this plant.” He has sent invitations to President Obama and the auto recovery czar to have a tour of the plant, which he thinks will result in it being operational. Whatever be the future of the plant in Spring Hill, residents are sure of their ability to wade through the times of misery. The year was 1990 when Bob Maguire, started selling Saturn vehicles in Bordentown, NJ, they were the first on the board to open the dealership when Saturn contacted them in 1989 and adds now it is time too think of new business with GM announcement of Saturn closing down. With the announcement by General Motors of wind down of Saturn vehicles after the acquisition deal with Penske Automotive failed, it left 350 Saturn dealers across the country have been left in the lurch and trying to find exit strategies including Bob and Marcy Maguire for themselves and also for the workers. The on going events and trends means almost definite death of Saturn brand that was set up by Saturn to fight against the Japanese imports in the 1990’s and currently it is estimated around 13,000 jobs are at stake. The exact business plan is still vague, and the steps being taken after the shutdown of Saturn operations in October 2010 is still being formulated, but for one thing, the business will be as usual. We are looking for new business and selling new Saturn vehicles to anyone who is interested to purchase the last ones in the breed. He does not close out the option of shutting down the two dealerships at Bordentown and Toms River a year from now and is keeping all options open. Currently the two dealerships employ 25 people each. Maguire further adds that it is not is ambition to close down the dealerships, but would be forced if no viable options come up and says they still provide gainful employment to all their workers. Saturn launched in 1990 with its own exclusive tag line, “A different kind of Car Company” gained popularity in America by their low-key showrooms and no-haggle pricing. General Motor had launched Saturn with the hope that with the dent free plastic panels, it would attract the young generation with the hipper cars. It built the Saturn plant at Springhill, TN devoted to Saturn vehicles. Although it attracted and drew huge crowds, the brand could never make enough money, although it was never disclosed how much the company made profit on the Saturn brand. The Saturn customers brand base we have, have their culture of their own and there were never a customer that was unhappy with their Saturn vehicle they purchased from us and sadly it’s true. The closedown events have come as a shock to everyone. GM had even agreed to keep 3 models running beyond 2011 and after which Penske have had to come up with their own products made by any other manufacturer. There is very little hope that talks could be reopened without another supplier in place before the deal was signed according to Anthony Pordon, a Penske spokesperson. It would take several years to design new vehicles, especially foreign vehicles which meet US standards and Penske would beat risk selling no products once the contract with GM expires. The production of new Saturn vehicles will be stopped as soon as possible. But no layouts are expected according to Sherrie Childers, GM spokeswoman. The Saturn owners can still go to their dealers for servicing and will be able to go to certified GM dealers once the Saturn dealerships close down. Maguire said it was even true for his NJ dealerships. They would continue to be in business and would take care of Saturn customers who are in need of servicing. The close down announcement has come as surprise to everyone. In this damn economy it is difficult to forecast anything but we are doing the best as we can, according to Bob Maguire. 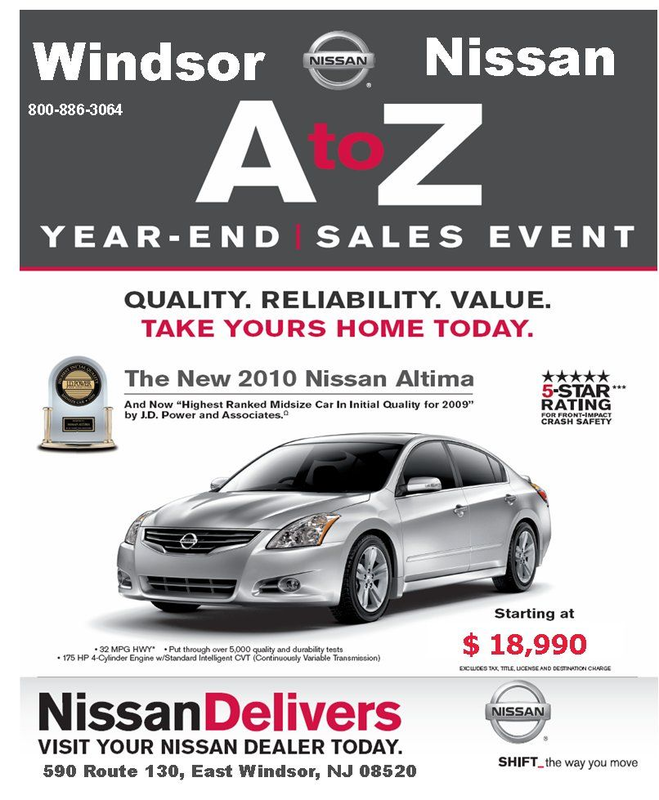 , NJ, certified GM Car dealer. 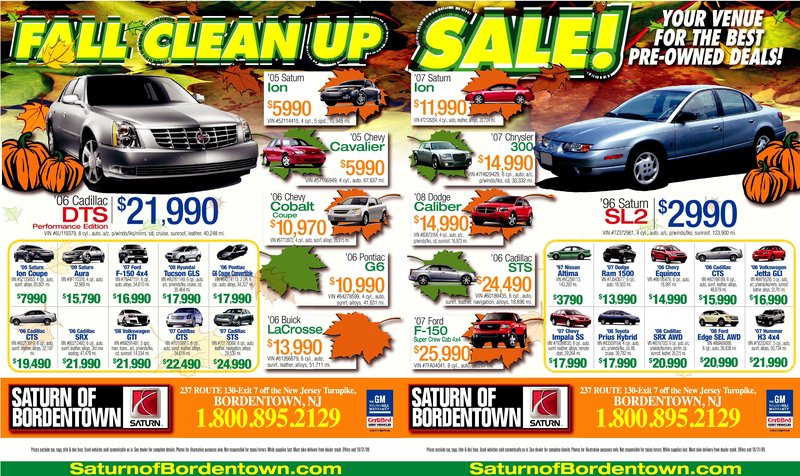 Outstanding October Deals at Toms River on wide range of Saturn Selected Models. Check how much you save.